President Muhammadu Buhari has said as a beneficiary of free and fair elections, he is not afraid of a credible process in 2019. Speaking at an interactive session with members of the Nigerian community in China, yesterday, in Beijing, the president reaffirmed his commitment to making sure that the 2019 polls, under his watch, will be free, fair and credible. He said Nigerians eligible to vote in the next general elections will be allowed to freely elect candidates of their choice. His Senior Special Assistant on Media and Publicity, Garba Shehu, in a statement quoted his principal as saying, “I’ve no fear about free and fair elections because that is what brought me to my present position. I know what I went through, and very few Nigerians can boast of trying four times (contesting for the presidency). across ethnicity and religion. “The Nigerian police, law enforcement agencies and the Independent National Electoral Commission (INEC) must respect the people to express their wishes,” he said. 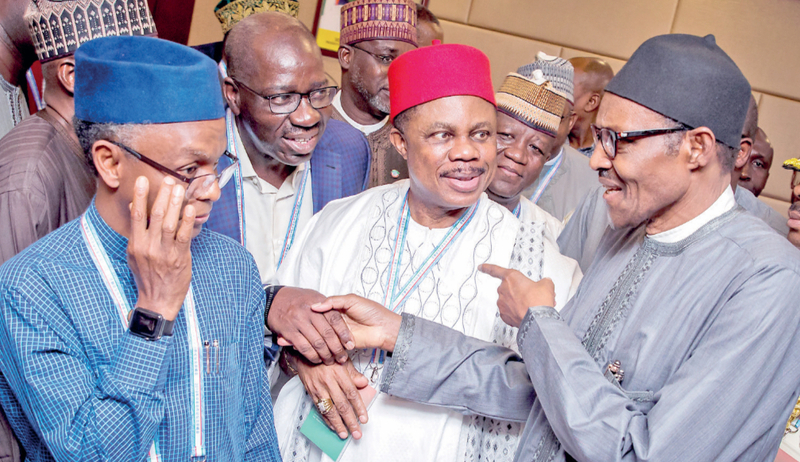 Buhari, while touching on security issues, reaffirmed that his government has succeeded in curtailing Boko Haram insurgents in the country, adding that the terrorist group no longer controls any part of the country. “The Boko Haram used to occupy quite a number of local governments in Borno State, but they are not in anyone now. They have resorted to a very dangerous way of terrorism, by indoctrinating young people, mostly girls and attacking soft targets, churches, mosques and marketplaces,” he said. According to the president, due to the effects of climate change, a farm that used to belong to five people now belong to 50 people; the weather condition, particularly the rainy season, is now unpredictable. Buhari blamed the farmers versus herders clashes on the shrinking of the Lake Chad, which has forced many cattle herders to seek greener pastures for their herds in other parts of the country. On Nigeria-China relations, the president applauded China’s generosity and contribution to the development of Nigeria, citing the successful completion of the Abuja-Kaduna railway line, built by a Chinese firm, and ongoing works on Lagos, Ibadan, Ilorin, Abuja and Kano railway routes. He said Nigeria and China are also negotiating on the Mambilla project. President Buhari advised Nigerians planning to travel abroad for “greener pastures” to do so legitimately and not to expect too much from their countries of destination. “You cannot seek greener pastures in a place where you are not respected because of the colour of your skin or your lack of education or other things. Personally, I think you will earn more respect when you remain at home and get a job,” he said. Acknowledging the material and intellectual support of Nigerians in the Diaspora to the development of Nigeria, President Buhari assured that his administration will remain focused and committed to providing the needed infrastructure and doing the needful for Nigeria’s prosperity. Earlier in his remarks, the Nigerian Ambassador to China, Baba Ahmed Jidda, thanked the President for his support to the Embassy, which led to the completion of the Ambassador’s residence. He praised Nigerians resident in the various provinces of China for being law abiding with the exception of few. The era this territory natives are deceived is over and gone forever. There’s nothing call “free and fair” election where there’s no Democracy. There’s no Democracy in this natives territory under the dead fraudulent political name Nigeria. Democracy exist only under the natives Disintegrated Republics which must be defended with the Sword in this final conquest of the Liberation Revolutionary Warfare of the natives which is the conquest of Sokoto which has begun. Existence of the fraudulent political name Nigeria founded by British bandits in this natives territory is illegal by law. Existence of fulani fraudulent criminal sultanate political government with its emirates in this natives territory is illegal by law. All the institutions etc. existing under the dead fraudulent political name Nigeria in this natives territory are illegal by law. Existence securities and freedom of this territory natives of this generation in this 21st century world international order is only under the natives Disintegrated Republics in Southern Countries Union- SCU which must be defended with the Sword in this final conquest which is the conquest of Sokoto which has begun. God given Victory is the natives. Only the Sword decides. God Is With Us!! !